OK, so it's from last year, but they're still beautiful. 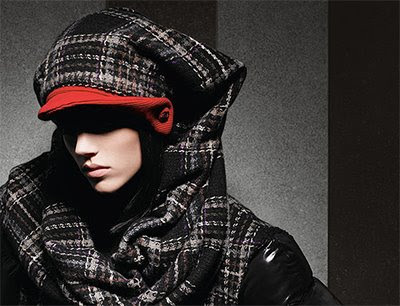 These photos are from the Chanel Fall/Winter 2007 Ad Campaign. You can see the rest of the pictures here. OMG i love everything about them!! i love the first one esp .. totally hott!! ..
i think they have finally realised the benefits of covering up. i saw the whole collection, many of which seem to be inspired by stylish muslim women! I've never been a fan of chanel, but these pictures have certainly made me reconsider. I love the first pic especially, its given me some new ideas about mixing colours and prints. The last one is also adorable. It's be great if designers did realise that not all women (Muslim or not) want to bare all. Anon 1, my thoughts EXACTLY on the fur lol. Moon, yeah most of them were completely covered - v. interesting! Umm Salihah, I've so gotta try the first one out next autumn.. don't know where I can buy long, hot pink leather gloves from though! I like the scarf with all the brooches. I want to try that out. It look so nice! 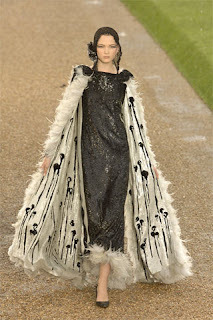 Good find Hayah, yeah this Karl Lagerfeld’s collection for Channel. Interesting point about the modesty inspiration but I think Lagerfeld concept was to outline the female body so he used textures and embellishments. I think the hoods seen in some of the models were just part of this theme.